St. Peter’s Square is the big square in the smallest country in the world. It is something like the entrance to the Vatican. Behind the square is the famous St. Peter’s Basilica, the most important church in the world. Every Wednesday there is a general audience of Pope Francis in St. Peter’s Square. Then there is a lot going on. In bad weather (often in winter) the audience takes place in the Audience Hall. There is a lot going on on Easter Sunday and Christmas (25.12), when the Pope traditionally gives the blessing Urbi et Orbi (for the city and the world, meaning the city of Rome). Also on other days many tourists come to St. Peter’s Square. On the right side is the entrance to the cathedral. Here already in the morning long queues form in front of the very strict entrance controls. If you want to go to the church, you are scanned like at the airport. The luggage is also scanned as the hand luggage at the airport. 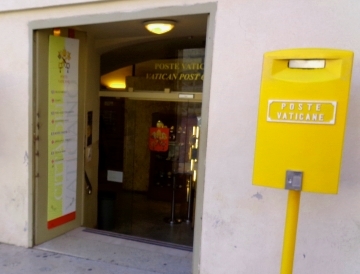 On the left side of the huge square the visitor will find the only branch of the Vatican Post Office. Here you can buy the famous stamps of the Vatican. There is also a tourist information office next door and clean and free public toilets. You have a very good view to the famous square from the dome of St. Peter’s Cathedral, to which you can go up for an entrance fee. With an area of around four hectares, Petersplatz is one of the largest city squares in Europe. The size corresponds to more than five football pitches. Since the entire Vatican State is only about 0.44 square kilometers in size, St. Peter’s Square occupies almost 10 percent of the area of the entire country. 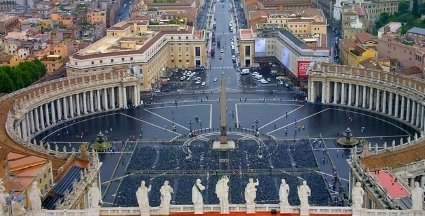 In Italian the main square of the Vatican is called „Piazza San Pietro“, in English St. Peter’s Square. In addition to St. Peter’s Basilica and St. Peter’s Square, there is a third very important sight in the Vatican. It is the Vatican Museum including the Sistine Chapel. Directions to St. Peter’s Square: If you want to get to St. Peter’s Square, the best subway station in Rome is Ottaviano. From here it is about 500 meters on foot to the entrance of the large square in the Vatican. There is a tram (also in Italy tram) and many bus lines nearby. St. Peter’s Square is closed to vehicles of all kinds. You can always see a lot of police in and around the square. 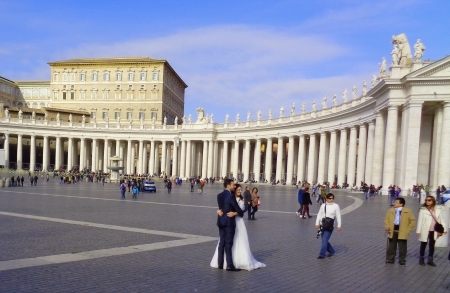 Opening hours St Peters Square Vatican: The public square is open day and night. Entrance to St. Peter’s Square in Rome: There is no entrance fee for St. Peter’s Square or St. Peter’s Basilica. Only for the ascent of the dome of St. Peter’s you have to pay an entrance fee.